Following a five year interlude from the studio and turntables, the giant void left by the legendary Warp Brothers has finally been filled and the silence finally shattered. The duo are exploding back on to the electronic music scene with a bang proving the wait has definitely been worth it. Rewind to the year 2000 and the release of their first single ‘Phatt Bass’. The Warp Brothers were catapulted to the forefront of innovative techno/electro music after the track smashed dance charts worldwide and was used as the epic opening soundtrack of the Hollywood blockbuster ‘Blade’. It’s not only become a club anthem but an iconic piece of music that’s still doing the business 15 years later. Despite the almost overnight success of Phatt Bass, the Warp Brothers were never destined to be a one hit wonder following it up with smashes such as ‘We Will Survive’ which reached top 10 in several countries including the UK and Germany, ‘Blast The Speakers’, ‘Cokane’, ‘Going Insane’ feat. Red Monkey, ‘Smells Like Teen Spirit’, ‘Blade feat. Red Monkey’, and the Push EP which reached number 1 in Switzerland. Shortly after their incredible early success, the pair took the Warp Brothers sound around the world from USA to Australia, Columbia to Japan, Ibiza to South Africa all while playing at the world‘s biggest festivals and clubs. Besides their own original productions, the Warp Brothers have been called upon for remix duties on countless tracks including Black Spider ‘Save Your Life’, Brooklyn Bounce ‘Born To Bounce’, Fragma ‘You Are Alive’ and DJ Balloon ‘Techno Rocker’ to list just a few. In fact, more than 60 tracks have had the inimitable Warp Brothers treatment. Since their revival they’ve already smashed Australia’s Summer Session Festival in June 2015. 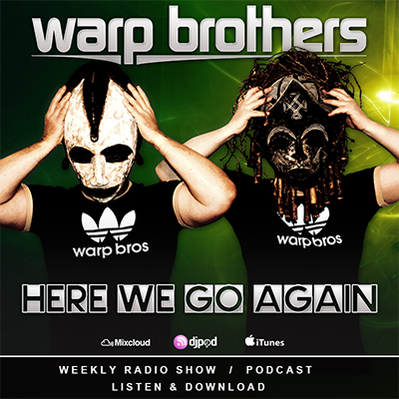 Their ‘Here We Go Again’ podcast/radio show is packed with 60 minutes of pure energy and jump up party sounds not to be missed! They are working in studio and are getting ready for their huge release in December 2015! One thing is certain: the Warp Brothers are back for good. Rewind to the year 2000 and the release of their first single ‘Phatt Bass’. The Warp Brothers were catapulted to the forefront of innovative techno/electro music after the track smashed dance charts worldwide and was used as the epic opening soundtrack of the Hollywood blockbuster ‘Blade’. It’s not only become a club anthem but an iconic piece of music that’s still doing the business almost 15 years later. Shortly after their incredible early success, the pair took the Warp Brothers sound around the world from USA to Australia, Columbia to Japan, Ibiza to South Africa all while playing sets at the world‘s biggest festivals and clubs. Besides their own original productions, the Warp Brothers have been called upon for plenty of remix duties on tracks including Black Spider ‘Save Your Life’, Brooklyn Bounce ‘Born To Bounce’, Fragma ‘You Are Alive’ and DJ Balloon ‘Techno Rocker’ to list just a few. In fact, more than 60 tracks have had the Warp Brothers treatment! Warp Brothers official comeback single ‘How You Like Bass’ is released 11/11/2014 on Carillo Records, and with much more in the pipeline, one thing’s certain: they’re back for good.